What you are going to read below is blueprint of all the benefits of buying property in Dubai. When you are investing your money in real estate and especially in an overseas property, you are not only investing in that particular piece of land/ house, you are investing in that country’s economy as well. One of the most important things to consider while buying property anywhere in the world is to consider the economic growth of that region and if the graph of economic growth has gone up in recent years, perhaps you should not hesitate much to invest your money. One of the biggest benefits of buying property in Dubai is that, the economy of this innovative city has been growing at a good pace. While rich in oil Middle Eastern countries and the capital of UAE, Abu Dhabi’s economy has suffered the punch of recent oil crises, Dubai has flourished and came out as champion of planning and economic growth in MENA region. By the time we entered in to the second decade of this century, Dubai had already cut its dependency on oil revenue to a level that today revenue generated from oil is only approximately 5 percent of Dubai’s economy. By the beginning of year 2015, Dubai had already become one of the 5astest growing economies in the world. 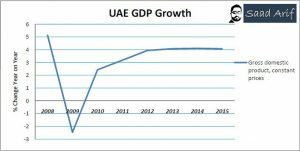 Below graph is a clear indication that the economic growth in UAE has become very stable after the global financial crisis of 2008. The upward movement of graph from year 2010 onwards and consistent performance during last three years is an indication that Dubai is definitely the best place in the world for real estate investment. If you owned a real estate property in a ghost town from where people are migrating to other places, would that property yield any revenue for you? Dubai is a cosmopolitan city where people from more than 200 different countries are residing hence the population of the city is increasing day by day. One of the biggest benefits of buying property in Dubai is that, people from all over the world are coming here in search of better career and business opportunities. All these people need a place to stay after all, no one is going to stay in hotels for the rest of their lives, right? Take a look at the graph below, we are in year 2016 at the moment and the population of Dubai has already reached 2.5 million. With the same rate of population growth in Dubai, the overall population of Dubai by year 2020 will reach to 3 million. The average population growth rate of Dubai is 4.7% which coincides with its economic growth as well. Many new housing projects have already been launched in Dubai to accommodate this increasing population which bring more investment opportunities for savvy investors who want to get higher return on their investments. Would you rather buy property in a city where there is no more development work going on or in a city where new innovative ideas are launched every now and then? 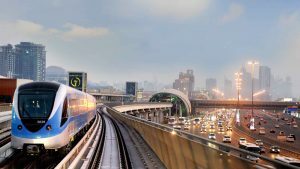 Dubai is already well on its way to become the smartest city in the world. There is always something new about Dubai and that is one of the biggest benefits of buying property in Dubai as well. Dubai is already home to tallest building aka Burj Khalifa and now there is going to be another tower taller than the Burj as well. The innovative ideas presented and initiated by Dubai government is a healthy sign that buying property in Dubai could be the best decision of your life. This might be one of the weird benefits of buying property in Dubai but it true. Yes, we have a minister of happiness in Dubai. The amazing government of Dubai is always working towards making lives of its residents better and keep them happy. Earlier this year, a new ministry for happiness has been added to UAE’s cabinet. The main responsibility of this ministry will be to measure the happiness level of Dubai’s residents and take such actions which will enhance the lifestyle of people living in the emirates along with making them happier than ever. With such innovation and dedication towards general public, one can only imagine how much your property investment will flourish in coming years in Dubai. Among the many benefits of buying property in Dubai, one is the sense of security that residents of Dubai enjoy. This is one of the major reasons why people find it reliable to come here in Dubai and start their new lives. 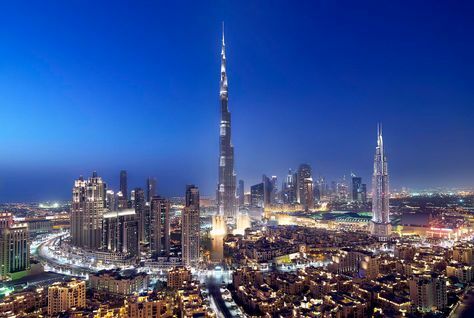 While many countries in the middle east region have gone through and still going through their fair share of political disturbance, Dubai remains the most stable city in MENA region. 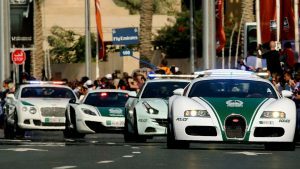 We all know Dubai Police because they are prompt, helpful and drive luxury cars as well. In my 3 years of living experience in Dubai, I have never seen two people getting into a fight even during a road side accident. The common practice is to get out of the car and call the police to come and assess the damage and announce the guilty. Theft or robbery is something which is unheard of in Dubai and this can be considered as the best of benefits of buying property in Dubai. You can leave your car’s door open in public parking and no one will dare to touch it in your absence. The biggest benefits of buying property in Dubai is that you can enjoy is that you can become eligible to get a resident visa based on your property purchase in Dubai. There are certain requirements which you need to match though. For example; the value of your property should be at least AED 1 million, there should be no mortgage against your property and it should be completely habitable. You will have to approach Dubai Land Department to get your investor visa against your purchase of property in Dubai. When it comes to investing in Dubai’s real estate market and enjoying the benefits of buying property in Dubai, there are variety of options available to choose from. Two main categories are residential properties and commercial properties. If your plan is to invest in a residential property, you can either buy an apartment or a villa and if you want to invest in commercial real estate in Dubai, you have options ranging from offices, labor camps to industrial properties as well. The acquisition cost in Dubai is much lower than in most other major cities in the world. Actually to be precise the average price per square foot in Dubai is USD 468 whereas in London, you will have to pay USD 3,208 to acquire same property. Look at the chart table below and you will get an idea how cheap it is to acquire property in Dubai as compared to other developed real estate markets around the world. Did you know that rental returns in Dubai are much higher as compared to major real estate capitals in the world? The best performing areas of Dubai are generating up to 10% rental yield on average. The average rental yield in New York is only 3.91%, in London it is 3.21%, in Singapore it is 2.83% and in Hong Kong you will not get more than 2.82% rental income. On a very conservative basis, the rental return in Dubai will be not less than 5.82% and that makes Dubai the best destination around the globe for property investors. Some communities in Dubai offer rental yields as high as 9 – 10% per annum. So if you want to enjoy the benefits of buying property in Dubai, don’t forget about the higher rental income that your real estate investment will generate in Emirates of Dubai. We all know that in real estate or any kind of investment, it is all about timing. People who invested in tech startups like Twitter, LinkedIn, Microsoft, Facebook and Instagram etc. saw their investment reaching to skies in coming years and that’s only because they saw potential in those opportunities and got in at a time when the stock prices were much lower. Same is the case with real estate and especially Dubai’s real estate market. For instance, I have been focusing a lot of energy recently on a new project Al Majara Expert and looking at the historical data, the people who bought properties in this project at the time of launch in 2006 had to pay an Average of AED 763 per sq. ft. Do you know what the average selling price is in the same project today after 10 years? It is AED 1,609 per sq. ft. which is an overall capital appreciation of 111%. There are many projects across Dubai that have witnessed similar capital growth. When comparing property to other major international centers, one easily concludes that property in Dubai is still cheaper and in many cases prime real estate is under-valued. I know, I know you all have been waiting to hear this special benefit of buying property in Dubai and yes it is true. There is no property tax in Dubai. Which means, once you have bought the property, paid the registration fee to Dubai Land Department, there is no other government tax to be paid against your property at all. This aspect alone has a great impact on the overall rental yield generated by your property in Dubai. 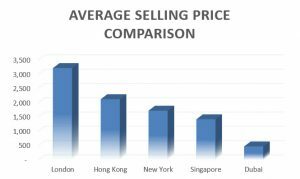 If you were to buy property in Hong Kong, you will end up paying up to 15% annual tax on that property and the ration in Singapore will be 13%, in London it will be 2.33% and in New York it will be 2.2%. Whereas there will be 0% tax imposed on your property purchase in Dubai and that makes the choice even easier to buy property in Dubai.